STILLWATER, Oklahoma – Anne Burkholder, who is perhaps best known as The Feed Yard Foodie, will be the featured speaker at Oklahoma State University’s 25th annual Totusek Lectureship on Nov. 2 at the Student Union Ballroom. Burkholder describes herself as an Ivy League athlete fueled by beef for many years before she truly “understood where beef came from.” She is now a mother of three and living in Nebraska, where she and her husband run a cattle feedyard and farming operation. Burkholder was voted to Vance Publishing’s “40-under-40 in Agriculture” in 2013 and was awarded Beef Magazine’s Trailblazer Award in 2014. The National Beef Checkoff presented her its Advocate of the Year award in 2017. Anyone wishing to attend the 5:30 p.m. to 8:30 p.m. event should contact the OSU Animal Science Graduate Student Association’s Kelsey Bruno by email at kelsey.bruno@okstate.edu, and she will issue an invitation. The night will begin with a social hour, allowing everyone to visit with old friends and new acquaintances, then dinner, culminating with the lectureship featuring Burkholder. The ASGSA organizes the annual event, which always sat well with “Dr. Tot” as he was often affectionately called by students, staff, faculty and alumni. “Dr. Tot and his wife Nellie were tireless advocates for students, the department and university, and animal agriculture throughout Oklahoma and beyond,” said Blake Wilson, ASGSA faculty adviser and an assistant professor in the OSU department of animal and food sciences. A Cowboy alumnus as well as a faculty member, Totusek earned his bachelor’s degree in animal science from then Oklahoma A&M College in 1949, after serving in the U.S. Army Air Corps during World War II. He then earned his master’s and doctoral degrees in animal nutrition from Purdue University before returning to Stillwater in 1952 and embarking on a storied career of teaching, research, public service and administration that lasted for 38 years as an OSU faculty member. “For me, what comes to mind first is Bob’s reputation as a coach of OSU’s livestock judging teams, which was a particular passion of his,” said Dennis White, a friend, colleague and former student of Totusek’s. The OSU Livestock Judging Team won 10 national and international livestock judging competitions while Totusek was the coach. A member of the Totusek Lectureship Advisory Committee since its inception, White lauds Totusek’s many achievements as administrative head of what was then called the OSU department of animal science for 14 years. Totusek was instrumental in the development and construction of the OSU Animal Science Arena, which was built in 1988 to replace the arena that was part of the old Animal Husbandry Building when it was torn down to make way for the OSU Noble Research Center. In 2015, the arena was renamed in his honor. 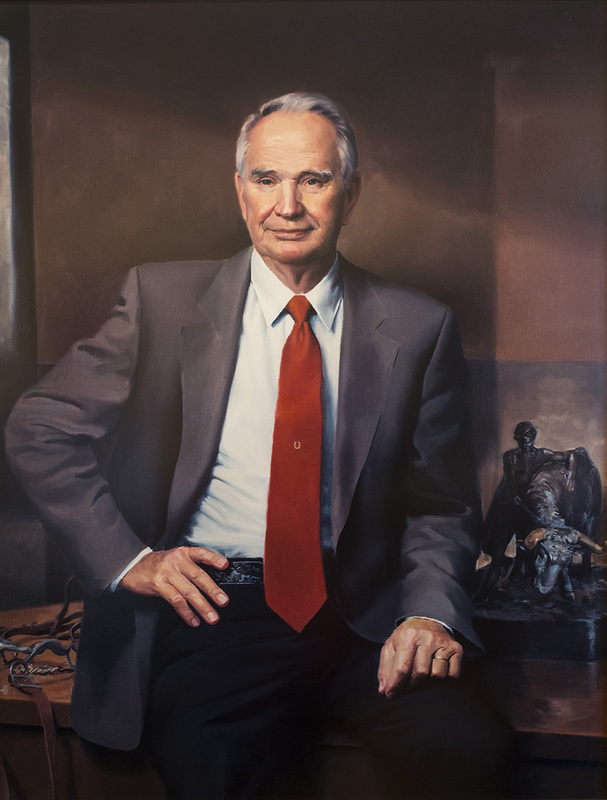 Upon his retirement from OSU in 1990, Totusek barely slowed down, serving as an ambassador and distinguished elder statesman for both the department and OSU’s Division of Agricultural Sciences and Natural Resources. He was initiated into the Saddle and Sirloin Club at Louisville, Kentucky, in 1997, the most prestigious honor awarded to an animal agriculturist. In addition to the animal science arena, Totusek was instrumental in the construction of the OSU Animal Science Building. He also helped lay the groundwork for the development and construction of OSU’s Robert M. Kerr Food and Agricultural Products Center, the OSU Willard Sparks Beef Cattle Center and the OSU Swine Teaching and Research Center. Totusek was responsible for record-setting donation campaigns, and became a driving force behind the OSU Animal Science Alumni Association. One of his final leadership contributions was helping the ASAA establish five purebred-teaching-center endowments. A native Oklahoman, Totusek was born on a farm between Kingfisher and Garber to Aloise Karbusicky Totusek and Emil Totusek. Both of his parents’ families were immigrants from Czechoslovakia and were active in the local Czech communities. Growing up during the Dust Bowl and Great Depression, he often recalled that his parents were poor but had a large garden and plenty of milk, meat and eggs. They delivered food to a number of Garber-area families in need every Saturday. Totusek often explained those early experiences impacted his life’s direction to become an advocate for the power of agriculture. After his passing, the way “Dr. Tot” was fondly remembered by so many made a lasting impression on the Totusek family. For many years the lectureship was funded by industry sponsors and people who personally knew Totusek. This past summer, his three children – Darla Flanagan, Don Totusek and Diane Stearman – endowed the lectureship with a gift of $125,000. Burkholder, another champion of agriculture who is looking forward to being the 2018 Totusek Lectureship speaker, explains there has been a shift from previous generations in that today the majority of Americans likely spend more time worrying about “where their food comes from” and “how is it raised” than whether or not they will have adequate access to food. Burkholder said the combination of good people and good technology also is key to promoting environmental sustainability, citing that those involved in agriculture remain stewards of the land. Anyone seeking additional information about the 2018 Totusek Lectureship should contact ASGSA President Morgan Pfeiffer by email at morgan.pfeiffer@okstate.edu or Bruno by email at kelsey.bruno@okstate.edu. Those interested in learning how they or an organization to which they belong can support the Totusek Lectureship should contact Heidi Griswold of the OSU Foundation by email at hgrisworld@osugiving.com or by phone at 405-385-5656.